I had a great time co-hosting a baby shower for my friend Nicola’s baby shower last weekend, and I’m working on getting all the pictures together to share on the blog. I started with the tea party, and I’m still wrapping up some of the activities, but here are some pictures and a short tutorial on the diaper cake! I used cloth diapers for our youngest through a lot of his first year, but I’ve fallen off the wagon lately. It really wasn’t that difficult, and I am so glad we did it. Cloth diapers do, however, mean a few extra loads of laundry each week, and I was losing buy-in from hubby and the toddler himself. So, despite my feelings of guilt, I have given it up. We’re slowly starting to introduce him to the potty, so hopefully our days of diapers are numbered. In any case, the timing works out well for me to pass these diapers on to Nicola and Victor. 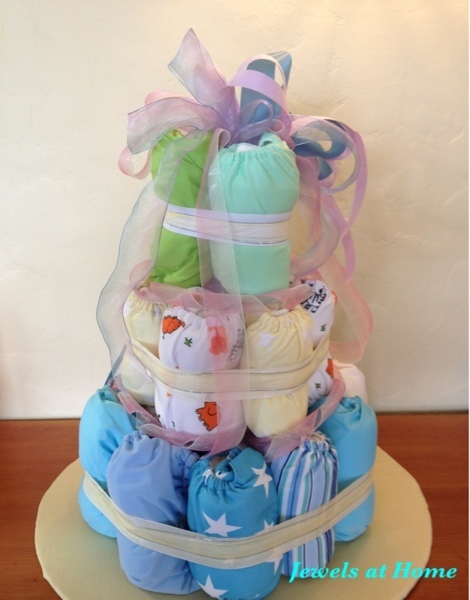 There are many ideas out there for beautiful diaper cakes. Most of them use disposable diapers or plain cloth ones. The diapers I had were the all-in-one or pocket diaper style, and I’ll write about how to use those diapers in another post for Nicola and the rest of you who want to get started. Since these diapers are bulkier than disposables and come in a variety of colors, I had to get creative with the design and owe thanks to Ari and Monica for their artistic input. decorations – more ribbon, toys, diaper cream, etc. I cut a large circle out of corrugated cardboard. It’s about a foot and a half in diameter, and I didn’t have a large circle to trace, so I taped a piece of string to the center, taped a pen about 9″ out from the center, and drew around the string to make a neat circle. I used a piece of scrap fabric to wrap the cardboard and taped it to the bottom. You could also use a cute wrapping paper. 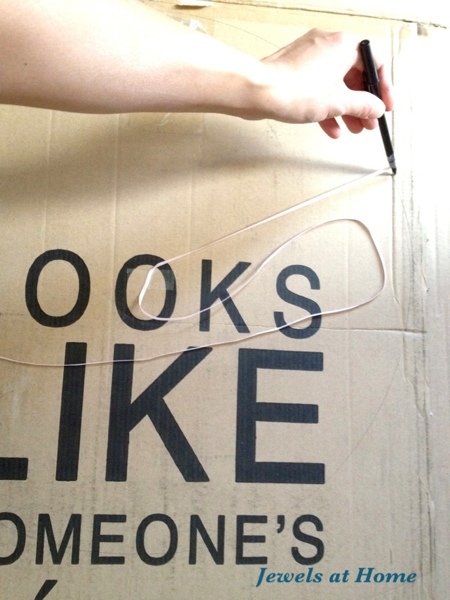 Draw a large circle on cardboard by taping a string to the center and a pen to the perimeter. 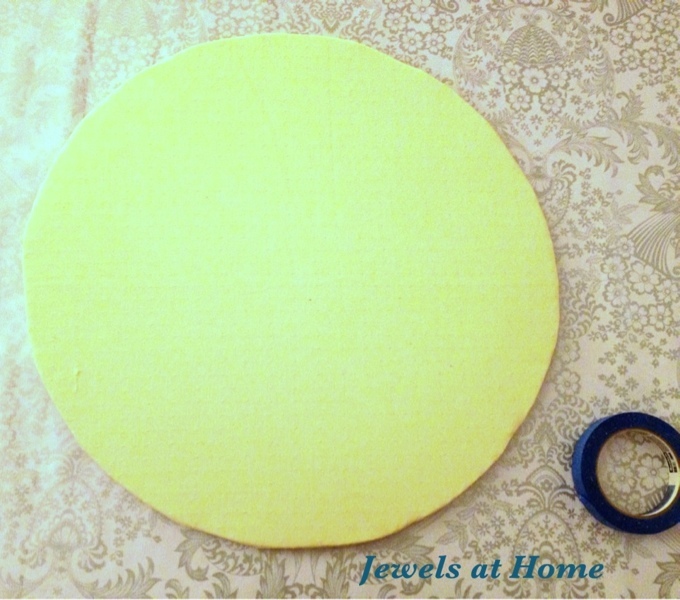 Wrap the cardboard circle in fabric or paper and secure it on the bottom with tape. Roll up each diaper and securing it with a small elastic. 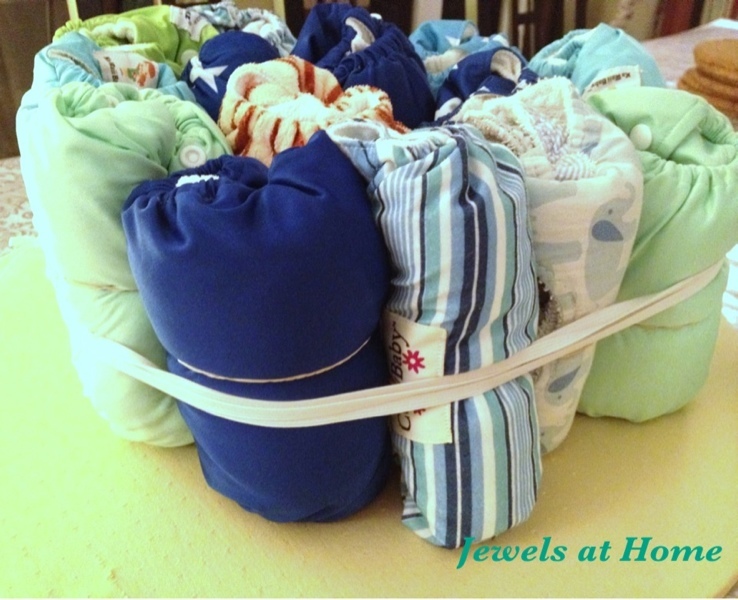 Group your first layer of diapers together inside a large elastic band. I used sewing elastic knotted into a loop. Once you have them tied together, you can rearrange them to get the look you want (this picture was taken before I arranged them). Because there were so many different patterns, I tried to group them by color (blues on the bottom; yellows in the middle; greens on top), and I hid the diapers that stood out too much in the middle (the tiger stripe diaper, the dark blues). 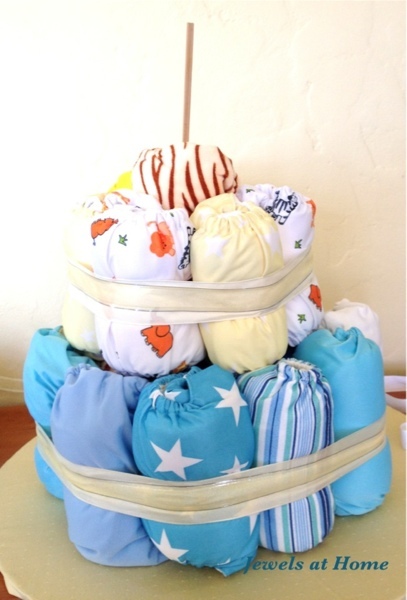 Make the first layer of the cake by grouping the rolled diapers inside a large elastic band. Put something tall in the middle of the first layer to help attach it to the next layer. 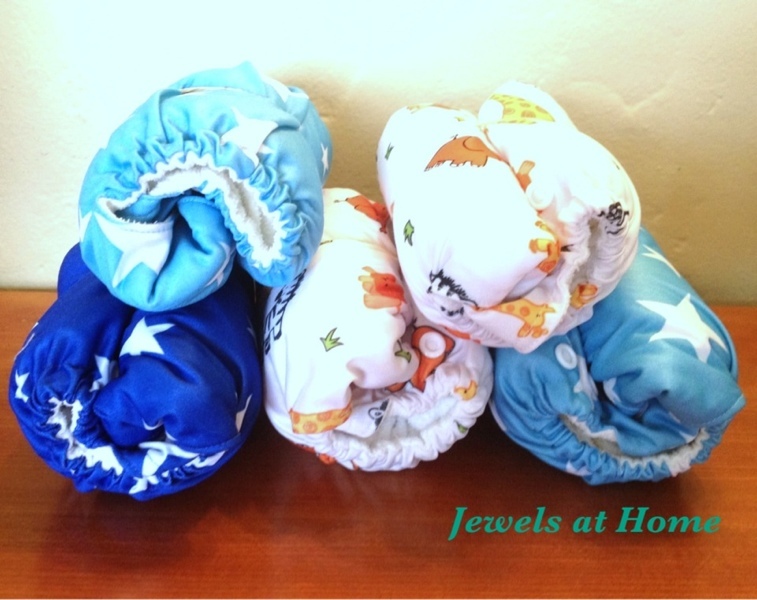 I used a roll of diaper liners (these are amazing, by the way. The poop sticks to the liner, and you just dump the liner in the toilet and flush it, leaving you with a much cleaner diaper to wash). Put something tall in the center of the first layer to help attach the next layer. Add your second and third layers, keeping something that projects upwards in the middle, to secure the layers to each other. Add a second and third layer, using something like this chopstick in the middle to keep the layers steady. When each layer is done, you can tie a decorative ribbon around the diapers and remove the large elastic. 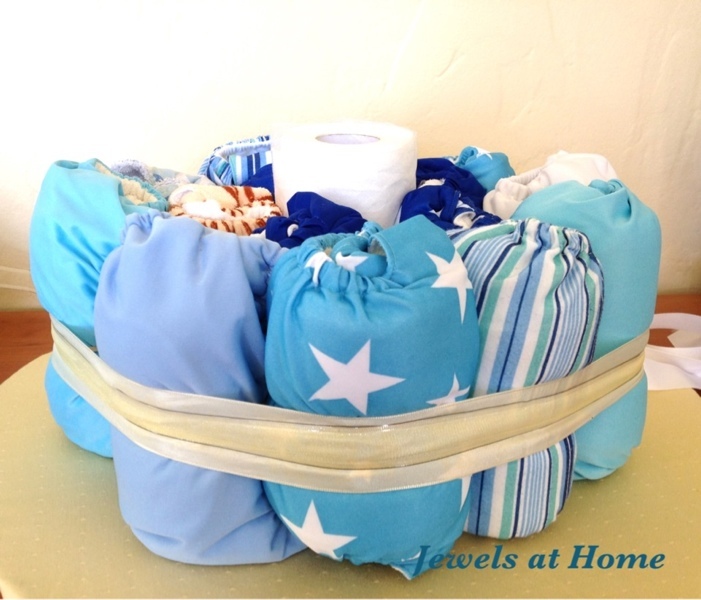 I used two layers of wired ribbon, and it made the bundles of diapers very secure. You could add little toys, bottles, diaper cream, etc.. I just added some ribbons to the top and around the edges. I folded pink and blue ribbons and secured them with a paperclip before stuffing them in the top. 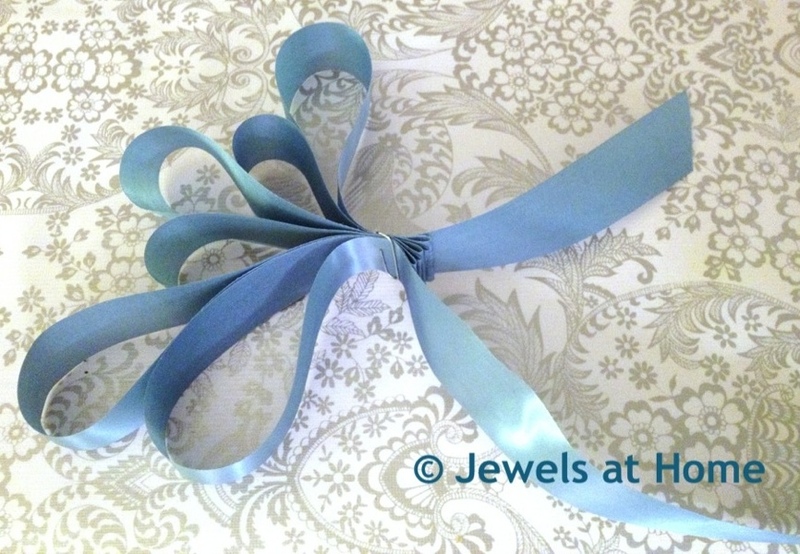 Gather some ribbon and secure it with a paperclip for decorating your diaper cake. And here it is, the finished diaper cake! Finished diaper cake using cloth diapers. In retrospect, I will have to say that this is not as fast a project as it looks, mostly because I had to fiddle with the arrangements and colors to make all those different diapers work together, but it was a very cute addition to the baby shower, so definitely worth it. I’ll try to get the information on using the diapers up on the blog soon, as well as some more baby shower projects!